Laparoscopic liver resection has become possible with the availability of new instrumentation that allows a relatively bloodless liver transection. It can be performed via hand-assisted approach or total laparoascopic approach. However, it is still unclear which is superior in outcome. The aim of the present study was to compare the short term outcome of these two approaches. From January 1998 to September 2009, all patients with hepatocellular carcinoma (HCC) who underwent laparoscopic liver resection in our unit were included. A prospectively collected database was analyzed retrospectively. Perioperative outcomes included procedure-related morbidity and mortality were compared. 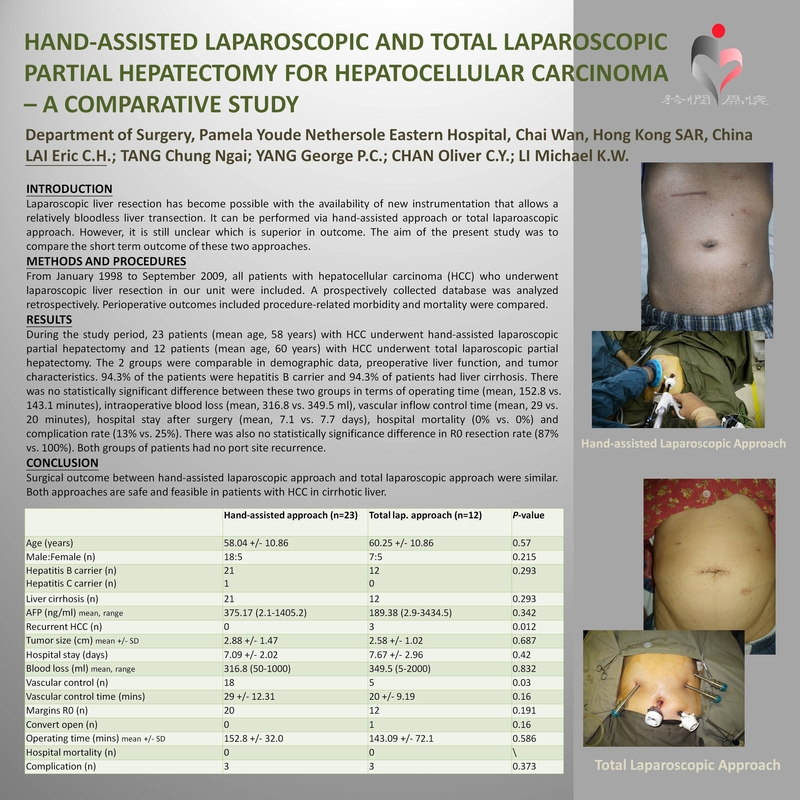 During the study period, 23 patients (mean age, 58 years) with HCC underwent hand-assisted laparoscopic partial hepatectomy and 12 patients (mean age, 60 years) with HCC underwent total laparoscopic partial hepatectomy. The 2 groups were comparable in demographic data, preoperative liver function, and tumor characteristics. 94.3% of the patients were hepatitis B carrier and 94.3% of patients had liver cirrhosis. There was no statistically significant difference between these two groups in terms of operating time (mean, 152.8 vs. 143.1 minutes), intraoperative blood loss (mean, 316.8 vs. 349.5 ml), vascular inflow control time (mean, 29 vs. 20 minutes), hospital stay after surgery (mean, 7.1 vs. 7.7 days), hospital mortality (0% vs. 0%) and complication rate (13% vs. 25%). There was also no statistically significance difference in R0 resection rate (87% vs. 100%). Both groups of patients had no port site recurrence. Surgical outcome between hand-assisted laparoscopic approach and total laparoscopic approach were similar. Both approaches are safe and feasible in patients with HCC in cirrhotic liver.